An extraordinary collection of interviews, essays, and statements by Chinese scientists, journalists, and intellectuals opposed to the massive Three Gorges dam on China’s Yangtze River. 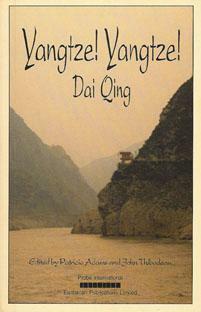 Originally published in 1989 as the democracy movement was gathering momentum, Yangtze! Yangtze! is credited with pressuring the State Council to postpone the dam, and inspired the democracy movement by striking an unprecedented blow at powerful state authorities promoting the dam. This pioneering critique is now available in English, expanded to include post-Tiananmen events. Chapter 2: THE BANNING OF YANGTZE! YANGTZE! Chapter 16: ONCE THE GOLDEN WATERWAY IS SEVERED, CAN ANOTHER YANGTZE RIVER BE DUG? Chapter 26: MUST A FINISHED PROJECT FINISH ITS ENVIRONMENT?